We’ve had an unusual first week for a few reasons. I don’t expect to experience one like it again on any other project. On the first day, we hit the ground running. Our lead (and only) performer, David Judge, has not only written the play but it’s about the first ten years his life, so he already knows the characters intimately. 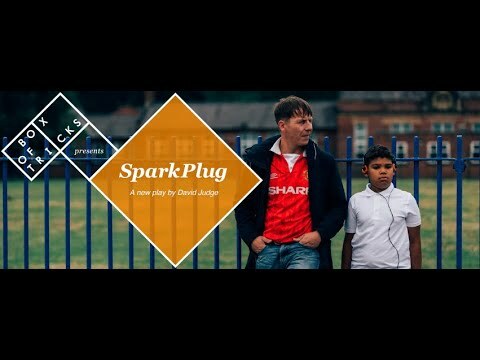 Hannah Tyrrell-Pinder, our director and dramaturg, has developed this play closely with David and seen it grow from a poem into the complicated and beautiful play that it is now. Katie, our designer, has had the set built already and most of the team have seen it. It is soon to join us in rehearsal so we can play about. So none of the opening formalities of a first day apply. Here we go. That said, there’s plenty of work to do, but we are just starting from a new place; now we can build the living world together in a room for 3 weeks. Without much need for introductions we read through the play, meaning we all sat back and listened to David’s amazing voice for an hour or so. It being his story, David already had such a sense of ownership over the words. He springs to life with an engagement and animation you only have when you are telling a great anecdote or heading down memory lane. The play is complete with nostalgic music and warped memories. When we started working we could go straight into piecing together the biographies of the characters from a place of detail, as most of these characters exist in real life as well as on the page. We discussed where we drew the line between David’s own childhood, and the life of the play, a permeable line which keeps changing and growing the more resources we bring in to the room. We started by putting together two timelines: a socio-political one, and one for Dave’s life, as the play jumps around in time quite a bit. The first was fascinating, we asked questions about the Irish community in Wythenshawe, as well as the Jamaican one in Moss Side. From the Hospital to the Reno Club, what was it like in Manchester in the 80s? Where was Dave and little David during Italia ’90? The race riots, Thatcherism, Man U games and the IRA all featured, as well as the opening of the Hacienda and the development of Princess Parkway. We also discussed the changing trends of social services and their policies around trans-racial adoption; the macro politics of UK race relations rub against to the micro world of David’s individual experience of being mixed race with a single white Dad for much of his life. Music is a huge storytelling device for us, as well as clearly evocative for David’s memories, and Hannah’s — both alive and well in the 80s (which I was not..). The music is bouncy and romantic. In fact, as I write this blog in the rehearsal room, Hannah and David are playing UB40 and singing along. 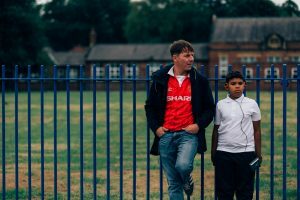 David now turns it to bassy Shabba Ranks and our little lunch time party turns into a conversation about cultural differences between white Wythenshawe and black Moss Side for Dave, and the different forms of performed masculinity they bring. We have had a host of other resources. On Tuesday, after poring over old family photographs and piecing together Dave’s timeline in the play, we fill out the picture by inviting David’s cousin into the rehearsal room to help us with some of David’s broken memories. The stories flow, and our partial world is given new creative energy. I can’t wait to press forward, into getting these characters solidly on their feet, and getting in our set to play with. What a luxury!